The Live IP Software Toolkit (LIST) enables advanced measurements in Live IP video production facilities. 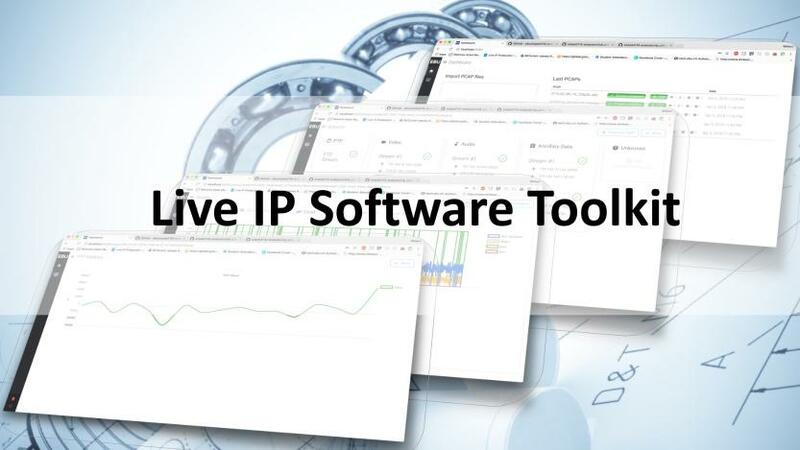 LIST is a suite of software tools that help to inspect, measure and visualize the state of IP-based networks and the high-bitrate media traffic they carry. These are crucial functions in environments that deliver production capacities based on flexible and scalable IP-based infrastructures. LIST can decode network streams and can be used to inspect basic and deep level network properties. It already supports the SMPTE 2110-20, -21, -30, -40 and SMPTE 2059 standards. The software is written in such a way that it can easily be extended to support other future standards and specifications. The Live IP Software Toolkit (offline analysis version) is freely available. Source Code: The source code can be downloaded from the EBU Github page for LIST. Docker: If you want to run it on your own infrastructure without compiling the code, click here. Dematerialized: Or you can take a look at our "dematerialized" version by clicking here.